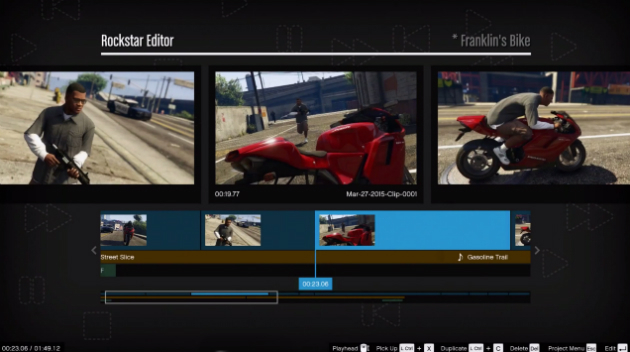 Rockstar Editor, the robust media suite for Grand Theft Auto V that allows players to capture and edit their own moments of mayhem in Los Santos, is bound for PlayStation 4 and Xbox One. Announced via the developer’s official blog, the feature has been exclusive to the game’s PC version hitherto, though Rockstar is now primed to bring the editing suite to current-gen consoles with the sequel’s next update. No word yet on a specific timeline for the patch, though the confirmation was made as the studio was congratulating the winner of the Ill Gotten Gains Rockstar Editor Contest. Having made its debut back in April, the Rockstar Editor has opened up a whole new frontier for Grand Theft Auto V players, allowing them to record, edit and share fan-made clips. Given the game’s affiliation with the YouTube community, news of the Rockstar Editor making the jump to PS4 and Xbox One will surely be music to the ears of fans, and it’ll likely only increase the sequel’s longevity. As a matter of fact, during Take-Two’s financial report earlier this month, it was confirmed that Rockstar’s magnum opus is now simmering north of 54 million copies sold to retailers, though there’s still no word on that single-player DLC from the developer. Now that GTA V is fast approaching its two-year anniversary, surely it’s a question of when – rather than if – we see the content pack unveiled? Grand Theft Auto V on PS4 and Xbox One is expected to receive its Rockstar Editor alongside the imminent patch.